‘Lights, Camera, Action!’ – Three simple but familiar words with one common connection – Bollywood or acting. To Become an actor/actress in Bollywood may not be everybody’s cup of tea – but it does attract thousands of people – from hip youngsters to more sober adults – to Mumbai every year to try their luck in the Hindi film industry. While a majority spend years struggling every day to cope with the harsh realities of life and face abject rejection before they go back, there is a handful who do make it big either in films or on television, albeit after a long struggle. Which reminds me of an incident that a veteran dancing star shared in one of his interviews. Keeping this little story in hindsight, is it worth going through all stress, embarrassment, rejection and struggle to become a successful Bollywood actor? For many, it is still one of the best careers to become rich quickly in no time! After all, no other career or profession gives you the kind of name, fame and money that acting does – and these are but a few of the obvious perks. The list is much longer. 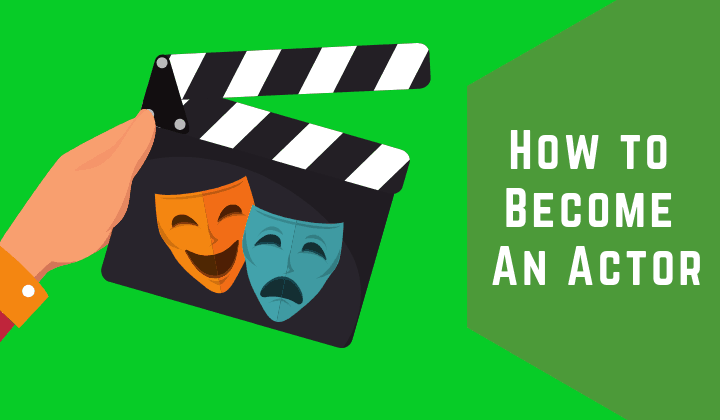 So for those of you who secretly aspire to become the next Bollywood sensation or a television superstar, we have compiled a handy list of 10 DIY tips to become an actor/actress – which if followed regularly – could smoothen your acting journey a great deal. There is just no substitute for practice – whether you want to become an actor/actress or a doctor. In the case of the former, it’s always a great idea to rehearse your acting skills and dialogue delivery at home before you start approaching production houses and casting directors for work. As the saying goes – Practice makes an individual perfect – and as a struggler, you will seldom get a second chance, so make sure to practice hard every chance you get. Tip: There are several videos available online that will help you to learn acting, including a few YouTube tutorials – make it a point to check them out. Often run by former Bollywood veterans, acting classes are a great way to start your acting career so that you get your skills assessed by a professional actor. As a bonus, you also get to brush up on your technical skills related to acting, singing, fighting, dancing and dialogue delivery. There are many professional acting classes such as Whistling Woods International, Actor Prepares, New York Film Academy, Stella Adler studio of acting, and many more to get started with your acting career. Most professional acting classes also help their students’ bag auditions from dominant production houses and frequently invite Bollywood professionals to teach their students. If you do well enough to impress your tutors – who know – you might be staring at a film poster with your face on it or starring in a new television serial in the not so distant future. Performing onstage is one of the best ways to learn acting by getting rid of your inhibitions, shyness and counter stage fright – as any actor will tell you. It’s also a tried-and-tested to radically improve your acting skills. Why? Just because there are no retakes when you’re performing live in front of thousands of people in a packed auditorium. Try and locate a few reputed theater groups in your city who may be recruiting new actors. Be ready to work for free, if need be, just to gain that invaluable experience of watching how senior actors do their magic onstage. When you get the opportunity to talk to them about ways to become an actor/actress, discuss your work and pitch for acting opportunities. This is not done the way you learnt poems in schools, mind you. A script is the most important document of a play, movie; you name it. As an actor, you not only have to master it, but also feel the emotions that the words are trying to convey. Anger, laughter, sorrow, exasperation, tension – it could be just about anything – and it holds the key to your success (or failure) to become an actor/actress. To master this, learn how to read well, understand what it’s trying to convey and then emote. Always remember, no actor who struggled to deliver his/her dialogues fluently and naturally ever made it big as an actor – so don’t let it be you. TIP: Reading the newspaper and books regularly is a great way to brush up on your reading, memory and speaking skills. One of the most important tips to become an actor/actress is considering your body language while pouring out dialogues with emotions. While your acting abilities and skills to emote are paramount, your body language is no less critical. These days the audiences have also got smarter and pay attention to not just how an actor acts onscreen but also the way he/she does it. Many struggling actors who are just starting out in their career tend to overlook this point – at their own peril. Regardless of whether you’re acting in a movie/play/TV serial your body language has to be on point every time – without ever looking forced or contrary to the requirements of the scene being performed. Ever wondered why Madhuri Dixit looks so great onscreen always? Ditto for Ranbir Kapoor and Deepika Padukone – because they are all extremely camera-friendly. Or to put it a little differently – the camera loves them. This is an outstanding quality to have, but it just can’t be faked. As they say, there is no fooling the lens. What you can do however is to stay fit and try to look your best, focus on your expressions and keep practicing to get even better for a better acting career. Last but not the least, make the camera your best friend. If you get scared or fumble when you’re facing it – it will show almost immediately. Like we said – there is no fooling the camera, ever. Acting is all about emoting, and your facial expressions play an important role in expressing your innermost emotions to the audience while performing a particular role. Needless to say, they need to be convincing. The audience needs to be convinced that your facial expressions are natural and not forced. Controlling your facial expressions is not that easy and needs a lot of practice. With the audience attention glued to your face, they are one of the most essential aspects in the journey to becoming an actor/actress. Acting is a very demanding profession and demands lots of energy. It’s not easy shooting for 10-15 hours at a stretch every day in all kinds of conditions and still look fresh and energetic all the time. Maintaining high energy levels throughout a hectic workday requires optimum fitness levels, so exercising regularly or hitting the gym daily is highly recommended. You also need to watch what you eat and stick to a healthy diet to keep your energy levels up throughout the day. Focusing all your energy into your performance is a proven recipe for giving better results on-camera and impressing filmmakers with your acting chops. It could also open the doors to better offers and more assignments for you and help to fast-track your acting career. When working in a creative profession like acting, it’s perfectly natural to overdo the acting at times. I can think of more than a couple of established actors who do it all the time! But while they can afford to since they are already successful, overacting can be dangerous for a new actor just starting out in the industry. While it may seem tempting to overdo things a bit – to impress the director – it’s important to try and stay as natural as possible when facing the camera or performing in a play. Overacting or hamming (as its termed) can be counter-productive for you and your acting career. In an industry where you may be asked to play any character – it helps to stay confident. After all, if you lose your confidence when performing, your performance can also be affected. As they say – confidence holds the key to success – and actors are no exception to this rule. There may be times when the efforts you poured into doing a specific role or character went unnoticed or the film/play bombed. That’s the time you need to believe in yourself and have faith in your abilities. Regardless of the number of times you fall down, you need to pick yourself up for the next opportunity that comes along. Besides, you can always learn something from failure – so keep your chin up always and never lose that confidence in yourself. While there is no guaranteed method to become a successful actor/actress, nothing is impossible through sheer perseverance, dedication, self-confidence and lots of hard work. When you’re really feeling low on confidence remind yourself of some of the inspiring short stories of famous actors like Boman Irani (he worked as a waiter in a Mumbai five-star); Shah Rukh Khan (worked as a concert usher for his first paycheck of INR 50); Nawazuddin Siddiqui (he was a building watchman in Delhi) and Arshad Warsi (sold cosmetics from door-to-door) – had to struggle for years before tasting success. Have patience and believe in yourself, if you are talented and dedicated to your work, it’s only a matter of time before you get that big break.